The Grain de Musc herself, Denyse Beaulieu for musing around with my head. An inspiration to me and to many others. 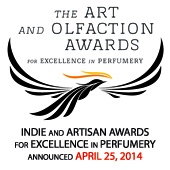 Aphrodesia by John Oehler – Perfume Thriller set in the ISIPCA Perfume School in Versailles. Available for the first time via Lucky Scent (previously this was only available from M.A.D.). This is the catalogue from The Art of Scent Exhibition at the Museum of Arts & Design in New York. The catalogue includes vials of the scents from the exhibition as well as an explanation as to how these scents are matched to various art movements such as Luminism, Post-Brutalism and Romanticism. The full list of art movements is right at the end of this post if you would like to amuse yourself by matching the artistic schools to the scents. The essays within the catalogue explain in historic detail the reason why Mr Burr has parlayed each ‘fume into a particular movement to support the concept that Perfume is Art. A comprehensive historical collection of eleven scents featured in the inaugural exhibition by the Museum of Arts and Design’s Department of Olfactory Art. The exhibition, curated by Chandler Burr, examines the historical evolution of fragrance as art over a century of innovation. Each scent is contained in a printed glass vial of and accompanied by a soft cover book of eleven essays placing each work in historical context. The catalogue is written by exhibition curator Chandler Burr. Eleanor is youngest Man Booker prize winner so far. This novel by a 27-year-old is the longest ever Man Booker winning novel (832 pages). Smell Theory round-up by Rose Gray – see ODOU magazine . In the first issue of ODOU magazine Rose Gray articulates the various theories of smell including Vibration Theory, Odotype Theory, Lock and Key Theory and several other historical and current theories. A marvellous post as always and so many much more reading to titillate the senses. Lee, Happy New Year to you for 2014 and Beyond. You are a sensualist. Jordan, you tempter, you! I’ll never get anything done looking at all these links and lists and then going to the library to find the books etc etc! Ha, Part 2 is coming soon. I think you may have already read all of these ones by then. I know how you feel Bookish One. I’ll have to check out The Art of Scent 1889-2012 Exhibition Catalogue by Chandler Burr at Luckyscent.com. Thanks, Jordan. Hey, Happy New Everything to you Flaconneur for 2014 and Beyond. The catalogue is a great read especially as you can sniff the subject at the same time as deciding whether you agree or not with Chandler’s categories. I am still uncertain about Post-Brutalism.